When a baby presents with a seizure, doctors will perform a thorough examination, focused on finding the underlying condition. The doctor will be looking for the level of consciousness, muscle tone, body-posture and reflexes as well as differences between movements on each side of the body. The doctor will also examine the skin carefully for birthmarks, changes in colour, rashes, bruises or bleeding, all of which are sometimes signs of the cause of seizures. All other body systems will also be checked. The doctor will then perform some blood tests to work out if an immediate treatment is needed. Imbalances in salts and chemicals in the body and infections will be ruled out first. Often the doctor will want to rule out an infection of the brain: meningitis is the infection of the tissue layers surrounding the brain, encephalitis is an infection of the brain itself. To do this, the doctor will perform a lumbar puncture – a test where your doctors will drain a little amount of cerebrospinal fluid – the fluid surrounding the brain and the spinal cord – with a small needle from the lower part of your baby’s back. In most cases antibiotics will be started, as it takes a few days to be sure there is no infection. Next the doctor will perform an electroencephalogram (EEG) – this is used to record the baby’s brain activity. It can pick up or “hear” the very low intensity electrical signals from the brain cells with the help of electrodes on different areas of the baby’s head. Using a computer, the doctors can analyse the EEG recording and detect the typical pattern of seizures. We use several electrodes so we can look for seizures in different parts of the brain. During a seizure we see rhythmic activity (sometimes called “waves” or “spikes”) in some or all areas of the brain. We can give medicine to stop fits (antiepileptic drugs) and the seizures may stop but sometimes they may start again and further medicine is needed. During an EEG recording you will notice a lot of different waves or rhythmic changes that do not represent abnormal brain activity. For example, movements of your baby’s head, any movements of persons in the room, or even just patting the baby while the EEG was running will result in changes of the EEG trace (we call them “artefacts”). An experienced EEG interpreter is trained to differentiate the artefacts from abnormalities arising from your baby’s brain activity and our ANSeR software system attached to the EEG machine has a special programme to draw our attention to episodes when seizures may be happening so we can look at the recording closely. 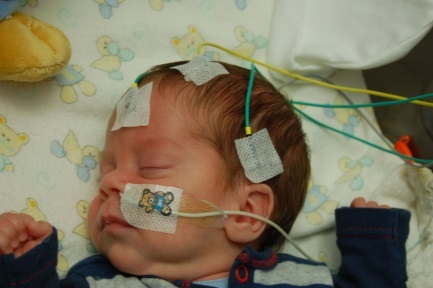 As clinical features of neonatal seizures are variable and in many cases we cannot be sure that a baby has seizures, continuous monitoring of the electrical activity of the brain with EEG is necessary. At the same time we take a video recording of your baby to detect very minimal changes in behaviour that occur with seizures recorded on the EEG. We also monitor heart rate and oxygen levels in your baby, as often a drop of oxygen saturation and an increase in heart rate can be seen with a seizure. 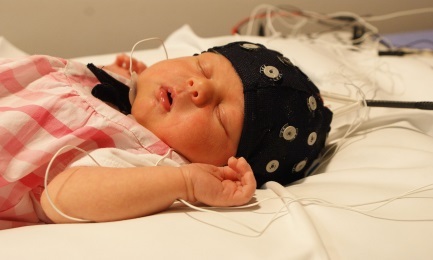 Above you can see a baby with applied EEG monitoring using an EEG cap. 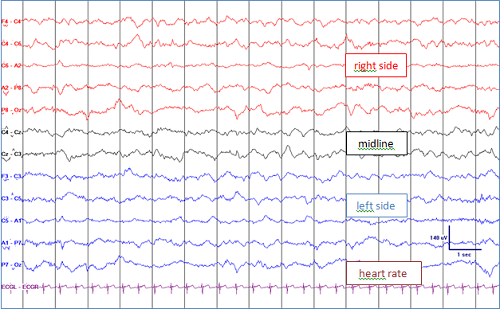 Above is a normal EEG trace in a newborn that is awake. You can see the mixture of different frequencies. The activity of right side of the brain is represented by red lines (channels) and the left side is represented by blue lines. The heart rate is registered at the same time and demonstrated in the last trace (in violet). The interpretation of a multichannel EEG requires special expertise and not all neonatal intensive care units (NICUs) have this available 24 hours a day, so we use a special display that makes it easier to detect seizures called the amplitude integrated EEG (aEEG). This can be done with all the EEG electrodes in place, or sometimes only four or five are needed. The aEEG is relatively easy to interpret. You can see the reduced set of electrodes on the head of the baby, attached with little white stickers. The teddy bear sticker next to the baby’s nose is holding the baby’s feeding tube and is not part of the aEEG system. 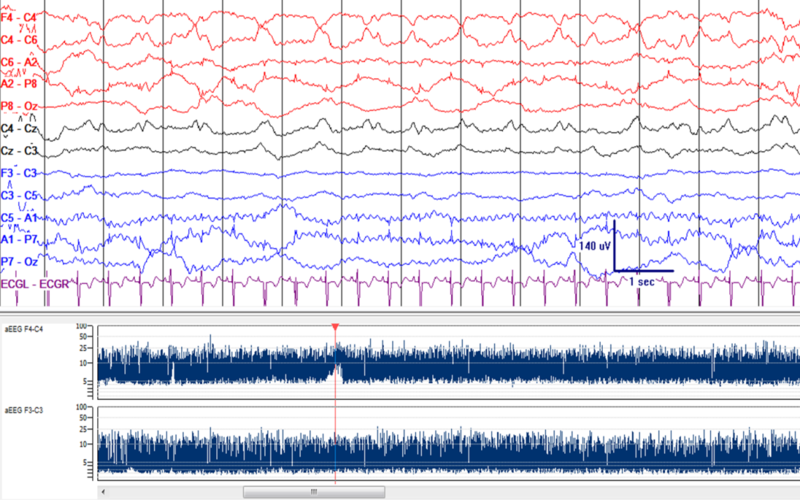 The traces above give the multichannel EEG where you can see the rhythmic activity of a seizure (first two red channels). Below this, the time-compressed, amplitude integrated EEG is projected, the time cursor in red indicates the position of the chosen time segment. In the upper aEEG trace you can see a change of the lower band limit with the seizure. Above you can see a baby ventilated on the intensive care unit with applied EEG monitoring. What Other Tests Do We Do? It is very helpful to have a test that will shows us something about the brain structure by taking a picture. We use technologies that are not harmful to the baby or brain. Magnetic fields or ultrasound avoid the use of radiation and are the safest, though sometimes x-rays are needed in a scan called a CT (or computerised tomogram). Cranial ultrasound is readily available in a modern neonatal intensive care unit and many doctors are skilled in its use. As your baby’s skull has not fully joined together in the first months after birth, we can use the soft spot (fontanel) on top of the head to use ultrasound without the bone making it difficult to see anything. Ultrasound works like a sonar: a sound wave is sent out (much too high pitch for us to hear) and we measure the reflection of echoes from the brain. As the tissues of the brain reflect sound differently, we can easily build up a picture of the brain. We can identify bleeding in or swelling of the brain quite easily. We can also get information about how fast the blood flows in the vessels inside the brain using a special type of ultrasound called Doppler ultrasound – this gives us really useful information about any swelling or blockages in blood vessels. Magnetic resonance imaging (MRI) gives us the most information about the brain and is usually performed in most babies with seizures. MRI uses a magnet to detect very faint signals from the brain and then the computer builds up a very accurate picture. The MRI takes between 30 minutes and an hour to complete and is best done when your baby is sleeping – e.g. after a feed or a small dose of a sedative. The MRI can identify many of the conditions that cause seizures and tell us how healthy the brain is. Different hospitals do scans in different ways and your doctor will explain this procedure to you.